Master Gardener and Master Naturalist Janet D. Smith shared information about native plants that she uses in her White Rock yard, including red yucca, four-nerve daisy, Turk’s cap, lantana and more. Download a PDF of her presentation. Dozens of neighbors filled the activity center of the Episcopal Church of the Epiphany on July 15 for our neighborhood meeting. The crowd of longtime residents, recent additions and first-time attendees came for updates about Heights Park and a presentation about native plants. Heights Park Neighborhood Association President Erika Usie kicked off the meeting by welcoming those in attendance and introducing HPNA Vice President Jeff Davis. Davis updated neighbors on the progress of adding more sign toppers to all street signs in Heights Park. The City of Richardson recently installed 12 new signs, and Davis said HPNA plans for the remaining 11 signs to be installed in the coming months. He also played a recap video from The Heights of Summer block party — a Heights Park tradition that will return in 2019. Mallory Duncan, HPNA membership chair, shared plans for a new initiative — a Welcome Committee for new neighbors. With the assistance of the city, members of the committee will welcome new neighbors, provide them with information about HPNA, local businesses and city services, and hand out recycling bags. If you are interested in becoming a member of the Welcome Committee, email contact@heightspark.com. Duncan also informed neighbors about changes to the Rotary Club flag program. Effective immediately, HPNA will no longer offer flag program registration with HPNA membership payment. Those interested in signing up for flag service may do so at the flag program website. Usie also introduced the newest member of the HPNA board, Jeff Jackson. Jackson, an integral member of the Greenleaf Gang that coordinated and held this year’s block party, will serve as the new social chair. 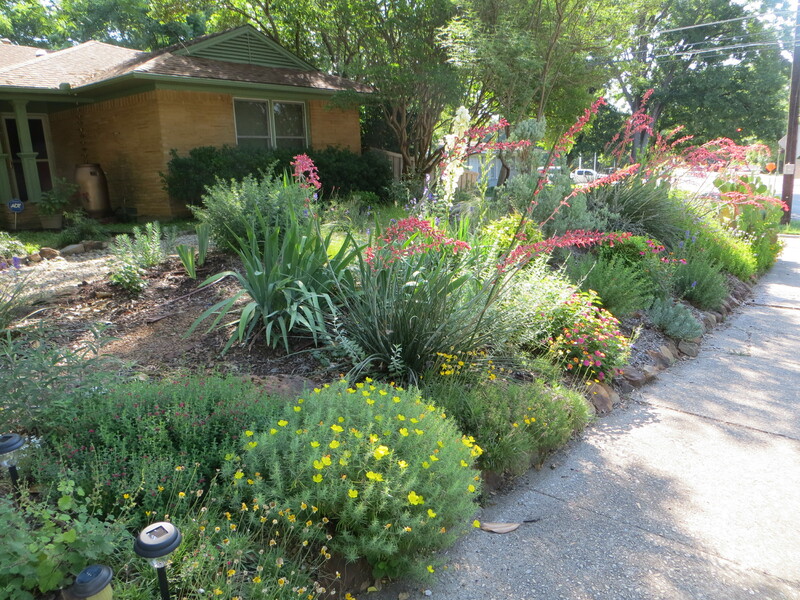 Smith, a resident of White Rock in Dallas, said she credits Carol Feldman of Heights Park for getting her interested in native plants and gardening that require less work than “alien plants” like St. Augustine and Bermuda grasses. She mentioned that the overall goal isn’t necessarily to have all natives in your yard; instead, a good goal over a period of time is having maybe half native plants plus one in your yard. 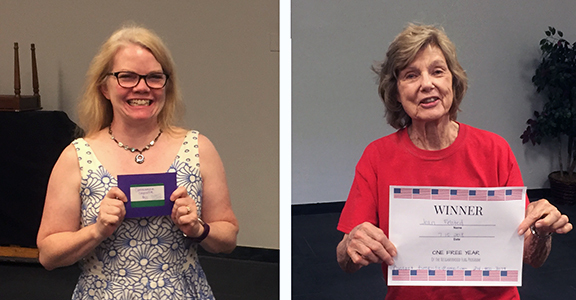 Susan Cluiss and Jean Falsted won prizes at the neighborhood meeting on July 15. Cluiss earned a gift card to Communion Neighborhood Cooperative and Cafe, and Falsted received free flag service for a year.